US Steel has seen dramatic gains and losses as Trump’s tariffs on imported metal grow closer. The stock has received a number of upgrades across Wall Street – a sign analysts believe tariffs will come to fruition. 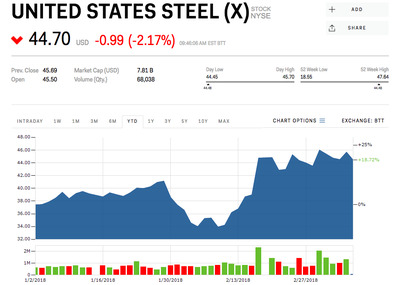 Shares of US Steel have already gained almost 4% since President Trump first said he was ready to place new tariffs on metals imported to the United States – and Wall Street thinks they could go even higher. The stock has received a number of upgrades from Wall Street analysts ahead of the expected announcement Thursday afternoon of a 25% tax on imported steel and 10% on imported aluminium. “U.S. Steel announced Wednesday their intention to restart one of two blast furnaces at their steel making facility in Granite City, Illinois,” Credit Suisse said in a note to clients raising their price target for the stock to $US55 from $US48 – 17% above where the stock opened Thursday. “In our view, this restart is a strategic move and makes sense regardless of 232 impact, as payback should be rapid and X is already short on volume,” analyst Curt Woolworth said Wednesday. BMO Capital Markets analyst David Gagliano gave the stock a $US50 price target on Wednesday, and Christopher Olin of Longbow Research raised his target to $US63 last week when the tariffs were first announced, according to Bloomberg. Wall Street’s average target is now $US43.87 – in line with where the stock was trading Thursday morning. US Steel is down 3% Thursday, trading at $US44.29 at the time of writing, and up 18% since the beginning of 2018.